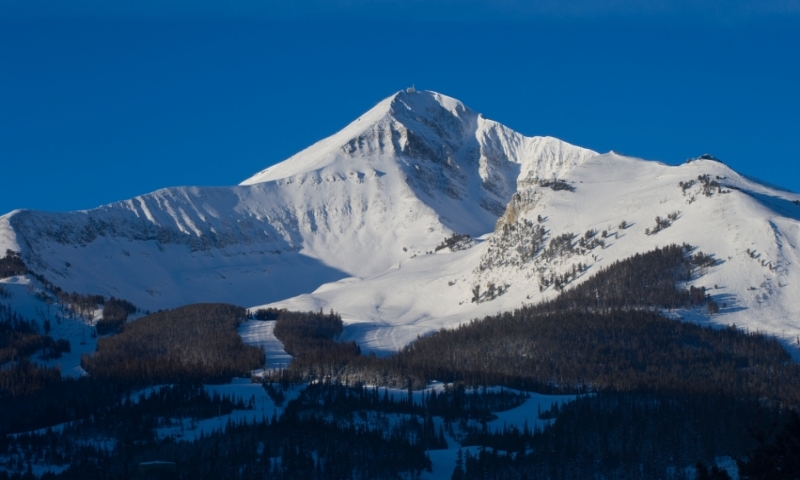 It's official: With a vertical drop of 4,350 feet, Lone Peak – the centerpiece of Big Sky Resort – is the biggest ski area in the U.S.
With a vertical drop of 4,350 feet, Lone Peak boasts the biggest skiing in America. Big Sky Resort, on the east and south of Lone Peak, and Moonlight Basin, on the north, together offer more than 5,500 acres of skiable terrain, including some of the most extreme in-bounds runs in the industry. Located in the middle of Montana's Madison Mountain Range, Lone Peak and its resorts also serve as a base camp from which to explore Yellowstone National Park and the Greater Yellowstone Ecosystem. What can I see and do on Lone Peak? Not only does Big Sky boast the biggest vertical drop in the United States, it has some of the most expansive expert terrain anywhere, and is renown throughout the industry for its non-existent lift lines. Now encompassing neighbor, Moonlight Basin, Big Sky Resort features 5,750 skiable acres. In 1995 the resort reached up to 11,150 feet with the Lone Peak Tram. This engineering feat gained riders access to some of the most challenging double-black diamond terrain found in-bounds (i.e. Big Couloir, diving right off the top of the peak), a range of steep chutes from glorious to gnarly (the South Wall); and some of the most pleasurable high-country bowl skiing in the biz (the 1,500 vertical feet of Liberty Bowl). Ride the Swiftcurrent Lift and then follow the treacherous Summit Trail to the 11,166 foot top. This 2.8 mile round-trip hike offers spectacular views. In the summer months, take the Swiftcurrent Lift, followed by a jeep tour to the base of the tram, followed by an exciting tram ride to the top. Lone Peak is obviously prominent when driving up to Big Sky Resort from US 191. It is located in the middle of Montana’s Madison Mountain Range, nearly equal distance from Bozeman and West Yellowstone. When can I access Lone Peak? Big Sky Resort is open for skiing, snowboarding and other winter adventures Thanksgiving weekend through mid-April. The summer season starts in June, with biking, hiking, zip lines and scenic chairlift rides. Contact Big Sky Resort at 800-548-4486.